There are many things to do in Istanbul. The European side is the main tourist attraction with many things to do, historical places, palaces, museums and so on. Although the Asian side is not as attractive as the European side, there are still many things to do. The Asian side is known to be the dormitory of the city because Istanbulians work on the European side due to density of business and commute back to Asian side every day. It is also believed that there is a difference in life style between both sides. Even if there aren’t any distinct differences in lifestyle, because of geography, history, density and business, people living on each side of the city feel like strangers on the other side, and long to get back home to their side. Go to Çamlıca Tepesi (Hill) for a nice cup of tea and a spectacular Bosphorus view. Watch a Fenerbahce game at the Şükrü Saraçoglu Stadium. Especially a derby between Fenerbahce and Galatasaray. Walk up the Yoros Fortress after having a rakı-balık meal in Anadolukavağı. Go to Sile to have brakfast near the Lighthouse. Go to Riva, Şile or Ağva to swim and sunbathe. Go to one of those “kendin pişir kendin ye” open-air restaurants on the way to Sile or in Poyrazköy, where you can order and make barbecue yourself. Go boating in the Ağva creek. Have a lovely breakfast near the marina in Fenerbahçe. Have an ice cream at the Ali Usta and drink tea or coffee with a friend at the gardens facing the old city, islands and Fenerbahçe. Go to Büyükada, buy a bottle of olive oil, walk up the hill to the Aya Yorgi Church, light a candle, leave the olive oil and have something to eat at the open air restaurant with a spectacular view of the Marmara Sea and the city. Walk to Kalpazankaya on Burgazada (second island) and have a meal at the open air restaurant. Go for a picnic on Heybeliada (third island before Buyukada). Sit at the Çınaraltı cafe near the ferry station in Kanlıca and have a yoghurt. Have breakfast at the Çınaraltı cafe in Çengelköy at the weekend and play backgammon after. Go shopping in Bağdat Street. Go for a walk biking by the sea side from Fenerbahçe to Bostancı. 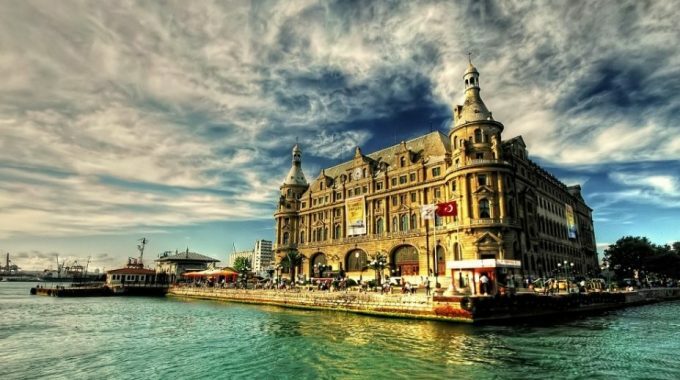 Go to Haydarpaşa train station by ferry from Karakoy and have a meal at the Haydarpasa Gar Restaurant with the passengers to Anatolia. Go for a walk at the Kadıköy fish market, have a meal at the Çiya, drink a serbet after. Go to the Kız Kulesi (The Maiden Tower) to have a cup of coffee. Go to Kanaat Lokantasi in Uskudar and walk to Fethi Pasa Korusu to have a tea or coffee and take Bosphorus photos. Have a rakı-balık meal at the İsmet Baba in Kuzguncuk. Go to Hidiv Kasrı in Kanlıca for breakfast or dinner. Go fishing in front of the Kuleli military school in Çengelköy. Merhaba! I am Ali Akpinar, a qualified and experienced Turkish language teacher offering Turkish language learning materials and courses online. Visit Learn Turkish language with Ali Akpinar page for more information and contact me by email at aliakpinar@hotmail.com if you would like to take Turkish language courses or classes online.